As the riots quickly spread across London on Monday night, I became glued to the rolling news coverage. The intensity and unreality of it was startling. As it darkened outside in Liverpool 8, I thought, no, it couldn’t happen here, not again. Soon though, rumours began on Facebook. I chastised some of my friends ‘Don’t encourage it!’, ‘Stop scaring people!’ It was denial. Hope that this area I’d spent so long telling people was about more than riots, wouldn’t descend again into chaos. But as images were posted of vehicles burning on Upper Parliament Street and Smithdown Road, it was confirmed. I stepped out. Our street appeared quiet, but police had gathered up the road. A short walk away there was fire. I went back in and hoped. The helicopter buzzed overhead and sirens and people ran past till the small hours as I lay in fear, not so much of my home being attacked, but of just how far this could all go. The next day, the streets behind mine were littered with burnt out cars, those already removed leaving ominous scars on the tarmac. A nearby, recently-opened Tesco Express had been looted. I was pleased to see none of the local shops adjacent had been attacked, though unsure if this was just because they had more heavy-duty security measures. The mood in the city was grim. Rumours flew around about what might happen that night: ‘Liverpool 1 to be looted’, ‘It will kick off again at 4pm’. 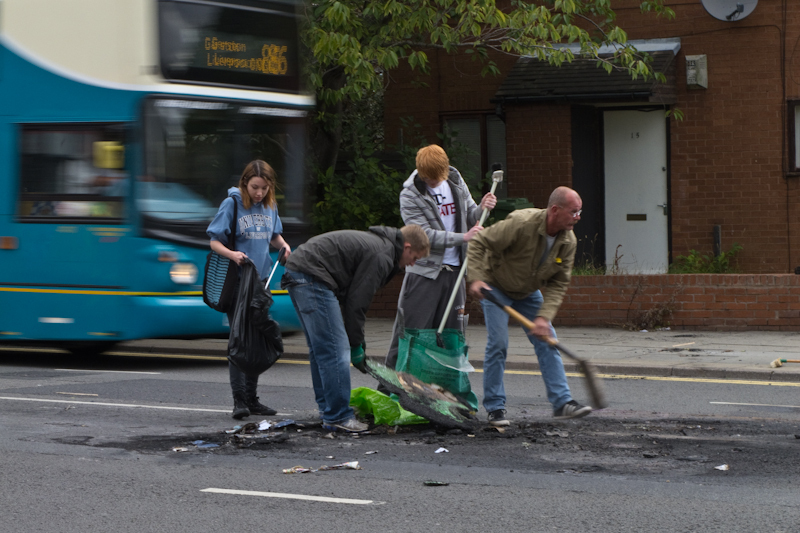 There were also signs of a fight back though; volunteers scraping melted bins from the middle of Smithdown Road, a community meeting in Toxteth to tackle the issues. Tuesday evening, shops shuttered early, events were cancelled. Fears were high. The local pub though, remained open, locals in true Scouse fashion taking the piss, even though some had lost vehicles. That night it remained relatively quiet in L8, not least because community leaders were on the streets talking with anybody that amassed. Out of earshot though, on Smithdown Road, day two was just as bad; more cars burnt and shops attacked. Frustration also, as the national media kept reporting ‘More trouble in Toxteth’, even though the epicenter was now in a different district. ‘They’ll never leave L8 alone’ a friend said. On Wednesday night came, thankfully, not rubber bullets, but heavy precipitation and relative peace. Normality restored, for now. Will it happen again? In a country as troubled and confused as ours, and in districts with such deep social and economic issues, I can’t say it won’t. But if a repeat is to be prevented, any solutions won’t be found in Whitehall, but in the community centres off Princes Avenue, Liverpool 8, if they dare to ask. An abridged version of this piece appeared in 15th August 2011 edition of The Big Issue in the North.